The Acropolis is the icon of ancient Greece—and of modern Greek identity. How did this come to be, and what moments of history led it to look and function as it does today? 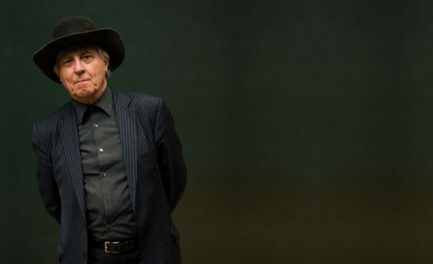 Thomas W. Gallant has been thinking and writing about these questions for decades. Professor of Greek history and archaeology at UC San Diego, he’s also editor-in-chief of the ten-volume Edinburgh History of the Greeks. 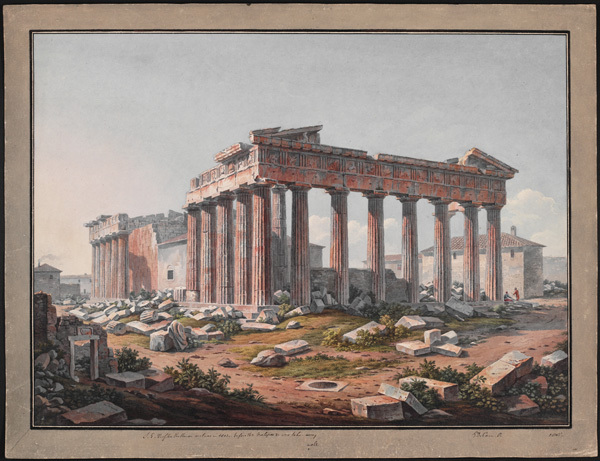 Gallant gives a talk at the Getty Villa on January 21 about the Acropolis in conjunction with the exhibition Greece’s Enchanting Landscape: Watercolors by Edward Dodwell and Simone Pomardi, which reveals Greek monuments and landscapes as they looked two centuries ago. In advance of the talk, he answered my questions about the Acropolis as structure and symbol. David Saunders: The Acropolis is a go-to destination for any tourist in Greece. Has the site always attracted travelers, or is this a modern development? 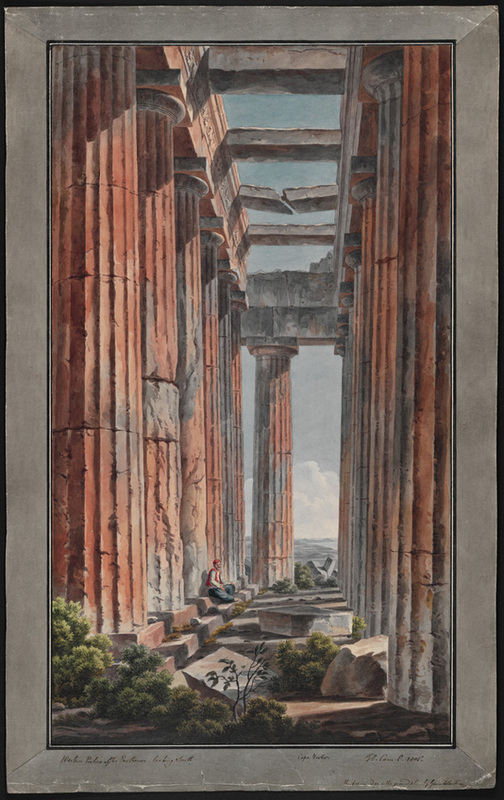 Thomas Gallant: Yes, since antiquity the Acropolis has been a very popular tourist destination. During the height of the Athenian Empire in the fifth century B.C.E., when the famous buildings were first erected, subject states were in fact compelled to attend the Panathenaic Festival [held at the Acropolis]. In later periods the Acropolis remained a very important religious site and attracted pilgrims from around the Greek world. All the way down through the Ottoman period, it continued to attract tourists who wanted to see the remarkable buildings. 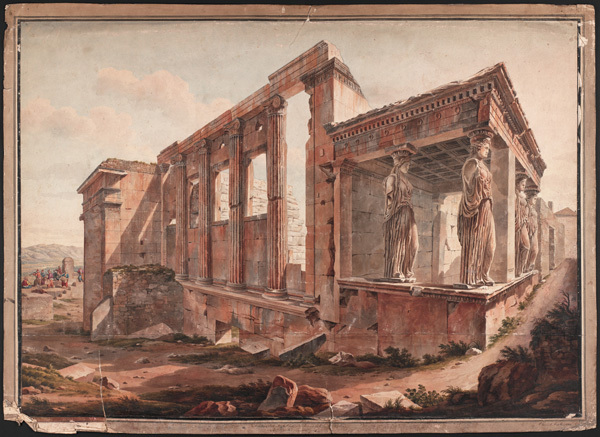 Visitors to the exhibition Greece’s Enchanting Landscape are often surprised by the Ottoman-era buildings in this illustration of the Acropolis from 1805. The site looks very different today. What happened? Three seminal events shaped the history of the Acropolis and determined why it looks the way it what does today. The first was the assault and bombardment of it by the Venetians during the Holy League War (1683–1699). A massive explosion on September 26, 1687, destroyed many of the buildings on the Acropolis and inflicted horrendous damage on the Parthenon. Before this it had been the site of the Ottoman administration, including the residence and headquarters of the governor, as well as of the garrison of Athens. Most importantly, the Parthenon had been turned into one of the greatest and most magnificent mosques in the Islamic world. All that changed with the Venetian bombardment, and never again would it be as resplendent. 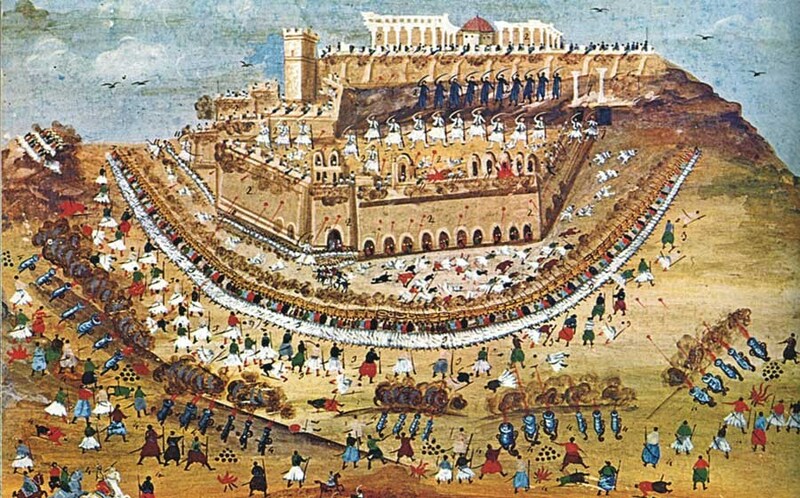 The second was the Greek War of Independence waged from 1821 to 1828 (although the Ottoman garrison did not evacuate the fortress until 1832). Because of its military significance and its impregnable walls, the Acropolis was intensively fought over during the rebellion. At one point it was the Greek army besieging the Ottomans—and then, when the tides of war turned, the sides were reversed. For almost two years the Acropolis was besieged and bombarded by one side or the other. 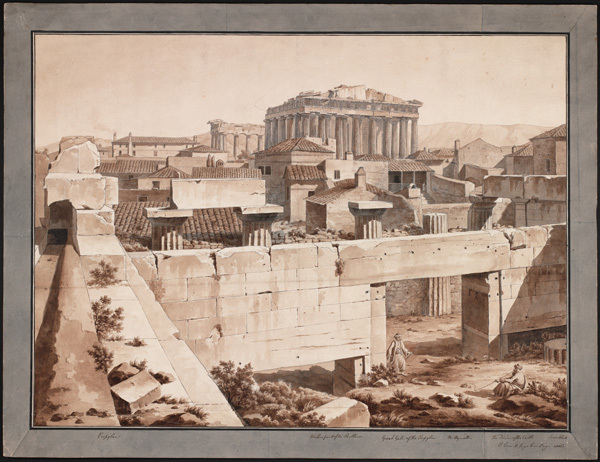 The third event, and the one that most directly accounts for the way the Acropolis looks today, was its excavation and destruction by archaeologists during the 19th century. The decision was made to erase essentially all material remains from the present back to the fifth century B.C. The medieval and Ottoman buildings that Dodwell depicted in his artwork were completely destroyed, and thousands of tons of material, including all the topsoil, were dumped over the side of the Acropolis. In other words, approximately 2,000 years of human history were erased in the name of “restoring” the Acropolis to what it looked like during the classical period. When the archaeologists had finished, for the first time in its history the Acropolis was no longer an organic part of the city of Athens. Dodwell’s account of his travels through Greece provides a rich record of the country in the decades before it achieved independence. In your own work, how objective a guide have you found Dodwell to be? Dodwell is a fairly accurate guide to the site. That is certainly true with regard to the ancient remains, which were, after all, his primary interest. He’s also a very valuable source for our understanding of the geography of the Acropolis and of Athens itself, and of life in the city. These insights come more from the comments that he makes in passing as background information. Once one filters out his deeply felt biases against both the Ottomans and the Greeks, one can learn a great deal about 19th-century Greek society. Some of Dodwell’s stories are quite humorous—like his tale about his encounter with the Ottoman governor regarding obtaining permission to work on the site. He bemoans as “Oriental” corruption that he had to seek political favors and pay to gain access to the citadel. The Acropolis is an incredibly picturesque and photogenic site. What’s your favorite image of it? My most favorite images of the Acropolis are the stunning watercolor paintings by Panagiotis Zographos of the two battles of the Acropolis during the Greek War of Independence. Not only are they visually stunning, but they are quite accurate depictions of the battles themselves. What does the Acropolis symbolize within Greece today? Athenians and Greeks generally have a deeply ambiguous relationship with the Acropolis today. On the one hand, it is the most readily recognizable symbol of Greece and Greek identity. The Parthenon in particular is immediately recognizable as the iconic image of Greece. On the other hand, it is a place where Greeks seldom go. For the first time in its long history, the Acropolis is no longer organically connected to the city of Athens. What I mean by that is during other time periods it was the site of religious observances and festivals, while in others it was the civic capital of the city. It was a place where Athenians lived, worshiped, and did business. Now it is solely and exclusively a tourist site. Greeks go there for school field trips but rarely after that. The site now really belongs to foreign visitors. One of the few times when the Acropolis is used by Greeks is when they want to send a message to the world. As I will show in my talk, it is not uncommon for Greeks to go on to the Acropolis and unfurl protest banners from its walls. But you’ll notice even then that the messages are aimed at a foreign audience, evidenced by the fact that they are written in English. It is truly ironic that in making the Acropolis the symbol of the Greek nation, archaeologists have largely divorced it from Greek society. What did you feel when you saw the Acropolis for the first time? I first went onto the Acropolis when I was an undergraduate studying in Athens in 1975. I recall being stunned by how stark and barren it appeared. I was blown away by the magnificence of the Parthenon, particularly because back then you could actually go inside it. My favorite memory, however, is from a couple years after that. Back then, security was much more lax than it is today, and after one particularly heavy snowstorm in Athens some of my fellow students and I sneaked onto the Acropolis and had a snowball fight. We were, of course, soon detected and shooed off the site. Still, for a brief moment we had our own Battle of the Acropolis. David Saunders I’m assistant curator in the Department of Antiquities at the J. Paul Getty Museum and co-curator of Apollo from Pompeii: Investigating an Ancient Bronze. 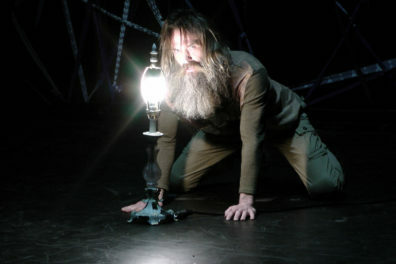 In 2009 I curated The Golden Graves of Ancient Vani at the Getty Villa. I'm currently developing exhibitions on Aphrodite and on a group of large South Italian vases that were restored in the 19th century. Exhibitions aside, my main research interests lie with ancient Greek vase-painting and iconography. Annelisa Stephan I'm senior Web writer/editor at the J. Paul Getty Trust and editor of The Iris. What does a Web editor do all day? She writes, creates, revises, and nitpicks text, photos, videos, and other fun stuff so that it's as interesting, accurate, and easy to find as possible, whether here on the blog, on our online exhibitions, in our visitor section, in our e-Getty newsletter (sign up! 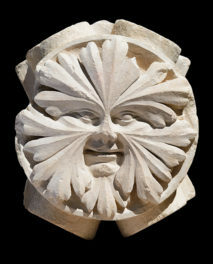 ), on our Flickr stream or Museum Facebook page, or wherever else you might be looking for it.